If you’re listening to your young reader read aloud—which you absolutely should be doing, nearly every day— and s/he stops to look up toward the ceiling, you might have a problem to address. Readers who are looking up are either 1) trying to remember the word or 2) they are praying that the word will magically come to them. Either way, it’s a bad deal. First, I teach all of my readers to “get set up for good reading” by placing both of their hands on their books. One hand holds the page(s) down, while the pointer finger of the other hand slides under each word, moving from left to right. (This habit alone can promote more accurate reading!) I teach my students to continually check themselves to be certain that the words they’re saying actually match the words they’re seeing. We make (point to mouth), the sounds (point to ear), we see (point to page). This is a no (right arm crosses chest), guess (left arm crosses chest to make an x), zone (make the “he’s safe” motion). *More sophisticated readers do not need to do this, however, you might notice that even YOU use your finger to assist in decoding unfamiliar words or when you are really having to work to pay attention to what you’re reading (for example, in a loud coffee shop). If you’re working with more advanced readers, even they might need some help in keeping their places. For them, I suggest having both hands on their books. When they’re reading the page on the left, they simply use their left thumb to slide down the left margin of the page and the right hand holds the book. When they’re reading the page on the right, they slide their right thumb down the right margin of the page and the left hand holds the book. 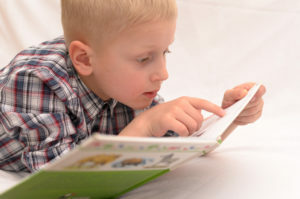 We want to minimize any opportunities for breaks in concentration so that our kids can get right back to their reading. Any point of frustration is a potential prompt to close the book, and once a book is closed, it can be a real chore for reluctant readers to return to their books. Imagine looking up to the ceiling to try to remember some word you’ve seen before and then loosing your place in the book. Would YOU want to keep reading after all of that distraction? That’s why I tell my students to keep their eyes on the page. I explain that all of the clues they need are right there under their noses. They’re actually within that tricky word. They are certainly not on the ceiling. Here’s where it gets rough. A lot of people (even excellent readers and teachers) do not know how to most effectively teach kids about those clues. It all comes down to making those sounds that we see. If your reader isn’t looking up while reading, YOU can look up and whisper some gratitude for that blessing! The same is true for writing. Does your child look toward the ceiling to recall how to spell a word? The chances are, s/he’s trying to remember how that word looks so s/he can copy the image from his or her mind onto the page. We’d rather have the child make the first sound(s) and record the corresponding letter(s) used to spell that sound, then the second sound with the corresponding letter(s). . . all the way to the end of the word. Though it is true that not all words are spelled correctly using phonics alone, most are. Even the ones that actually are true sight words (meaning they are non-decodable) have portions that are decodable. I will offer more and more information to help you raise outstanding readers and spellers. In the meantime, please resist talking about how complicated our “dumb” our language is. Most English speaking folks have very little understanding about how our language works. That doesn’t make it dumb. It doesn’t make us dumb either. It just means that we weren’t taught. But it’s not too late for you to teach your kids. I’m going to make it FUN!